Do you all know I try to sew? Try is the key word here, as I have a posessed sewing machine. What you see here is Little Man’s cape, because all three-year-olds need a cape, and a cool one at that. This machine, a Westin, was an alley find by hubby a few years ago. Last year I finallt took it in to get fixed up with the specific instructions to “not do anything if it’s not worth it.” I ended up with a $100 repair bill and a machine that refuses to sew consistantly. Even Hubby, who I personally consider my own mechanical genius, can’t figure it out. There’s a reason it was in the alley. Two Pizza Luce menus from 1999, A Galena IL travel guide from 1997 (we honeymooned there and as people with small children we won’t be doing the B and B circuit anytime soon), a brochure to Canoe Bay (can’t afford that place) and a pet boarding brochure. 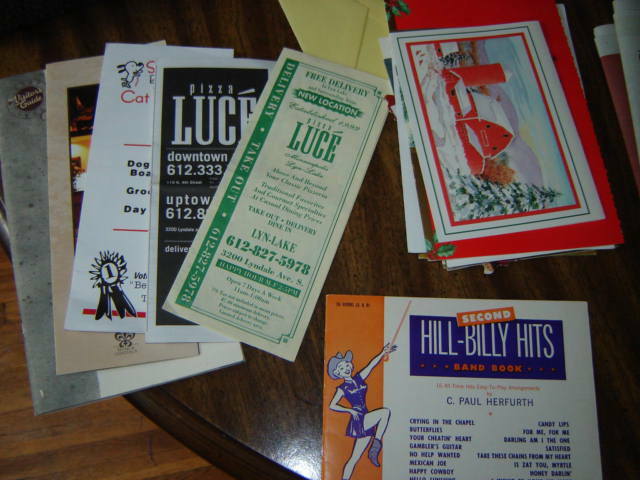 I also found a bunch of old Christmas cards and the book “Hill-Billy Hits”, which is marching band music for Eb horn. I have no idea where I even got that one. I’ve never played Eb horn, never taught Eb horn, and the music is so bad I would refuse to teach it anyway. Everything in that drawer is from the late 90’s! It’s more than seven things but it was all in one place, so what the heck. I’m considering setting up a second blog for this project, well see. In the meantime you can all be shocked by the amount of crap we have accumulated in our 13 years together. Thanks for all the lovely comments about the blog change! Trek and RheLynn both had some good suggestions (thanks!) 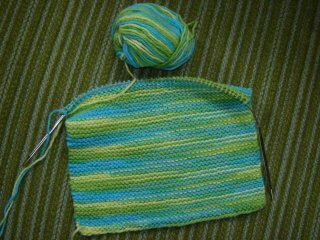 for my stripe issue, but I couldn’t find the “stuff stuff” in the template and when I changed the color by the ms.moto outerwrap line the stripe stayed the same. I’m going to go back and try it again, however. Some new funny contest entries today! Only two more days left! Last but not least, Knittybaby had his four month well baby check up yesterday. He’s a whopping 15.9 pounds now! This is great news as heart babies can have trouble putting on weight, but no trouble here. Aside from the coarctation he is doing great. We see the cardiologist next month and will find out more about his surgery then. 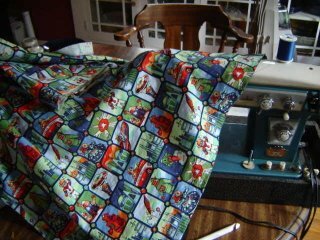 IF you decide you want to sew more often, you can easily get a good starter machine that sews a straight seam, with no temper tantrums, for about $100. If you’ve already put that much into the old machine, it’s time to get a new one. Heh, I won’t be surprised at what you’ve accumulated in 13 years – I’m surprised at how much I’ve accumulated in nearly 4 years in my condo!! I love that you made Little Man a cape and am glad to hear that Knittybaby is doing so well! Glad to hear Knittybaby is doing well, that is a great weight gain. I need to do the 7 things a week, except it might be 70!!! Yes, Little Man absolutely needs a cape! I sewed a really basic one for John when he was a little man. He wore it constantly. He wore it with nothing but underwear. He wore it with a mask, a big polar fleece hat of mine, matching polar fleece gloves and he was, “The Masked Avenger”. Good Job Knittybaby! Everyone needs a cape. That’s so cool, is he swooping around the house now, ready to save the day?